Food and Biscuits: Thursday - Homage2Fromage @ Primos!!! 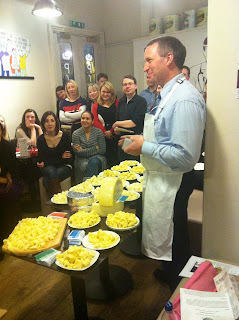 On Thursday we ventured to Primo for January's Homage2Fromage event - Alpine cheese (and some Lancastrian). We were a little late (my fault...delayed at work) and so missed the first cheese round of raclette, Vacherin Mont D'or and Lincolnshire Poacher. It shows it pays to be on time at Homage2Fromage! 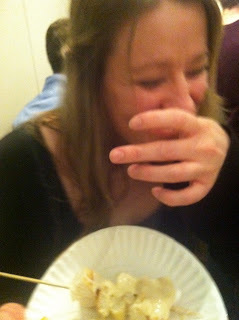 However we timed it perfectly for the fondue - a swirling mass of emmental and white wine. Loading up on skewers of baguette (the trick is to put multiple pieces of bread on each skewer), we were in for quite a treat! Nutty, slightly sharp, and the taste of the Swiss slopes, it was an excellent fondue. 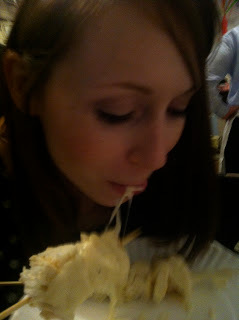 Note to self though - eating fondue is never going to be the most graceful of looks - see below. After ploughing our way through a considerable amount of baguette and cheese we were then treated to a talk by Conor from Dewlay, traditional Lancastrian cheese makers. Conor brought four Lancastrian cheeses progressing from a mild, Creamy Lancashire, through Crumbly Lancashire and Tasty Lancashire to a Garstang Blue. Dewlay's cheeses are "Beacon Fell Traditional Lancashire Cheeses", so are under the Protected Designation of Origin. Now my preferred cheeses are truly eye watering: I like to feel like I'm being challenged by my cheeses so I'll usually go for a really ripe goat or a blue. The Creamy and Crumbly Lancashires were a little mild for my tastes - too soft and milky. The Tasty Lancashire was getting more into my territory, but I was most impressed by the Garstang Blue - it was rich, creamy and nicely tangy. All in, a great event and I'm very much looking forward to the next one. Conor from Dewlay - look at all the cheese! 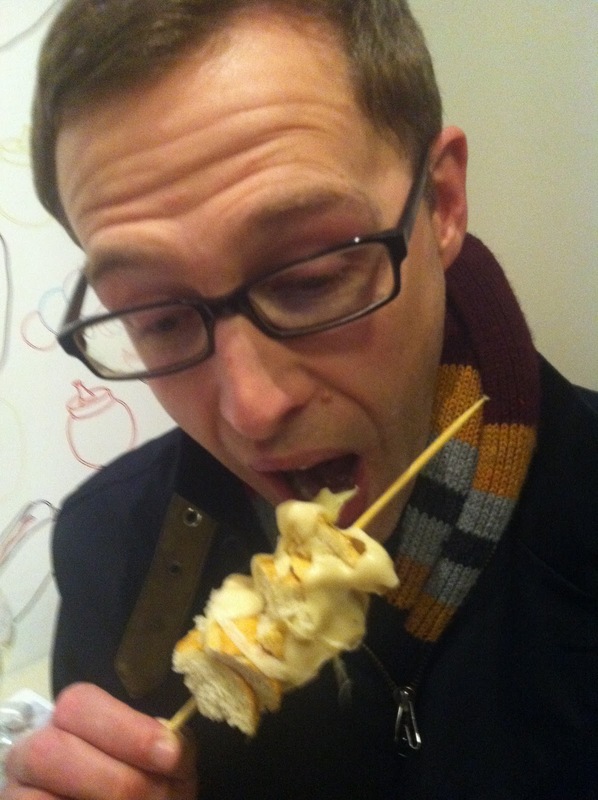 Joe, very much proving my point about looking good eating fondue.